Glaucoma is a disease which affects the optic nerve. 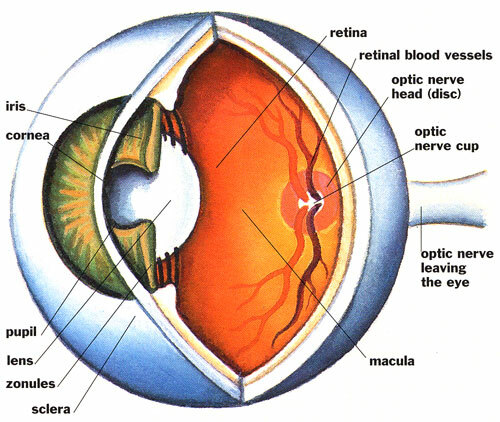 The optic nerve is responsible for transmitting visual information between the eye and the brain. If a person develops glaucoma, and does not have any treatment, over time they will gradually lose their peripheral (side) vision. Unfortunately, once the peripheral vision is lost, it cannot be restored. Early detection and treatment of glaucoma can slow down or even stop the loss of peripheral vision. It is therefore important to detect glaucoma early on so that further damage can be prevented. The inside of the eyeball is filled with a clear fluid called humor, with aqueous humor filling the front-half of the eye and vitreous humor filling the back half of the eye. Aqueous humor is produced by cells at the outside edge of the iris and is drained from the eye through a system called the trabecular meshwork. If the trabecular meshwork becomes blocked or damaged the amount of aqueous humor in the eye will increase, in turn causing the pressure inside the eye (the intraocular pressure) to rise. If the intraocular pressure becomes too high it causes damage to the optic nerve. The majority of people with glaucoma do have an intraocular pressure that is higher than average. It is important to note that some patients with glaucoma do not have high intraocular pressure, indicating that factors other than intraocular pressure must also play a role in glaucoma. Because not everyone with glaucoma has high intraocular pressure, glaucoma cannot be diagnosed by simply measuring the pressure of the eye. To accurately diagnose a person with glaucoma, our optometrist will consider the health of the eye, in particular the optic nerve and the trabecular meshwork. For this to be done thoroughly, it is vital that the patients pupils are dilated to provide our optometrist with a detailed 3D view of the internal structures of the eye. Detailed scans will be taken with an OCT and digital images also. The intraocular pressure, and peripheral vision need to be assessed also. Peripheral vision is tested using a computerised machine that detects deficits in the peripheral vision well before they become noticeable to the person themselves. The treatment of glaucoma currently revolves around lowering the intraocular pressure. Although not everyone with glaucoma has ‘high’ intraocular pressure, research has shown that lowering the pressure of the eye nonetheless can slow-down or stop the damage to the optic nerve in glaucoma. The intraocular pressure can be lowered using either medication (usually in the form of eye-drops), laser therapy, surgery, or a combination all of three. All three methods reduce the intraocular pressure by either reducing the production of aqueous humor or by increasing the outflow of aqueous humor from the eye. The preferable method of treatment depends upon a number of factors, including the severity of the glaucoma and the age of the patient. In general, medication is as effective at preserving vision as surgery; for this reason it is common practice to use medicine as the initial form of treatment.